When Dundrum Credit Union merged with four other credit unions in South County Dublin (Knocklyon, Sandyford, Sandymount, Ballinteer), it was faced with a brand dilemma. Keeping all under the Dundrum name didn’t make any practical sense for various reasons, the most obvious being the importance of location to each one. We worked with the executive and board of Dundrum Credit Union on the strategy behind creating a new name and brand identity which each location could take ownership of and trade under happily. The name Capital came from the members themselves via a naming competition. With the brand identity and, in particular the logo, brand research showed that there is a huge amount of goodwill and equity in the mark itself which a lot of newly merged credit unions were throwing away needlessly. We set about designing a new modern version of the older, familiar symbol which would work far better from an application perspective. Instead of using photography we felt it was fitting to use illustrations to bring a sense of charm to the identity. We designed and created the illustrations in studio, using a wide colour palette which complements the bright primary blue. Each local environment has been illustrated in the same style for use internally and to give each branch a sense of location. 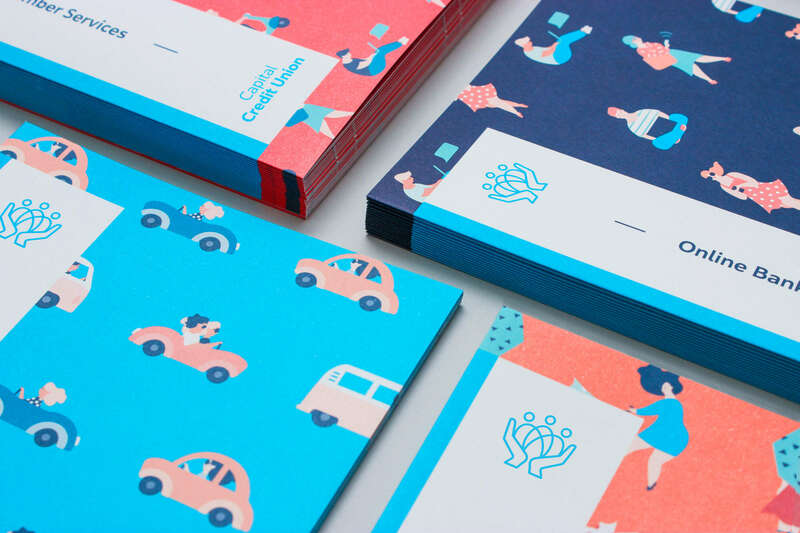 Works carried out included brand strategy and narrative around their key services. More than a bank, a community is the line which underpins everything. We developed the existing We Love Lending graphic and aligned it to the brand core. Works also included all print communications, advertising, merchandise, social media and environmental design across each of the five locations.